McLintock’s job is to get them housing. “We’re a non-judgmental agency,” he said. The goal is to get them under a roof, and then worry about what led them to the street. There’s something about sleeping warm, dry and safe that can clarify matters for people so afflicted. 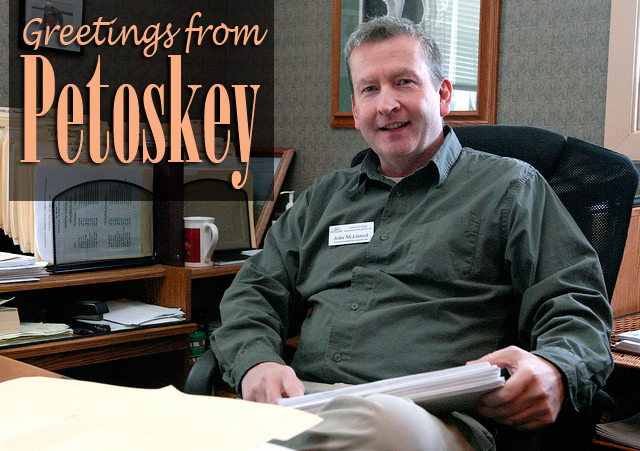 The region has adequate homeless relief, McLintock said, including a shelter in Petoskey that serves both men and women, and various churches. But the need is always there. On a recent afternoon, McLintock went down the line of people at a food pantry conducting a “PIT count,” or point-in-time count, to get a snapshot of who and how many were in need. Although most reported they were fine, he did sit down with one woman, who said she left her husband two months ago but had been staying with her sister, and was wearing out her welcome. “I can’t work,” the woman said, almost inaudibly. McLintock encouraged her to see a social worker in Cheboygan County, where she lived, and get the help she needs, before she becomes one of the 400. This is what the Michigan Legislature has given our state: trickle-up economics! We, the majority, need to change it.